Bellevue, Washington — July 17, 2018 — T-Mobile (NASDAQ: TMUS) today took the best wireless plan for travelers and made it even better – blanketing nearly the entire globe. T-Mobile customers already had unlimited data and texting in over 140 countries and destinations thanks to Simple Global, and now that coverage expands to over 210 countries and destinations. That’s so many places that it’s easier to tell you the few countries we don’t cover rather than list all that we do! 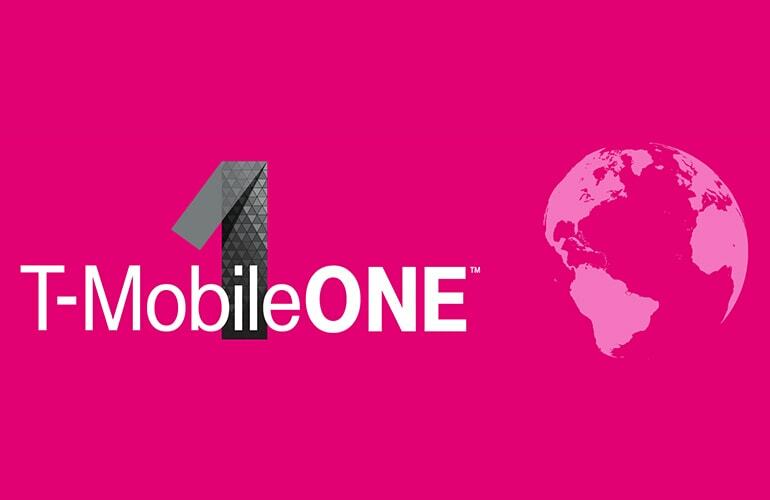 So, virtually everywhere you can travel, you get unlimited data, text and low rate calling – included in T-Mobile ONE. And today, the Un-carrier also introduces the industry’s best option for high speed data and unlimited calling abroad – a new T-Mobile daily data pass – for just $5/day. That’s half the price of day passes from Verizon and more places to use ‘em! T-Mobile changed international travel with Simple Global by permanently ending the necessity of turning off your phone when crossing borders or facing bill shock if you don’t in over 140 countries and destinations. Simple Global is included with T-Mobile ONE, meaning you can post and text photos, look up maps online and stay connected to loved ones when traveling abroad – worry free. Got AT&T or Verizon? Well, you’ve got no choice – they decide FOR you, taking more of your money when you travel internationally. That’s not how T-Mobile treats customers – at the Un-carrier, there’s no need to worry about adding a special international plan, and if you opt for high-speed data and unlimited calling, that choice is yours! 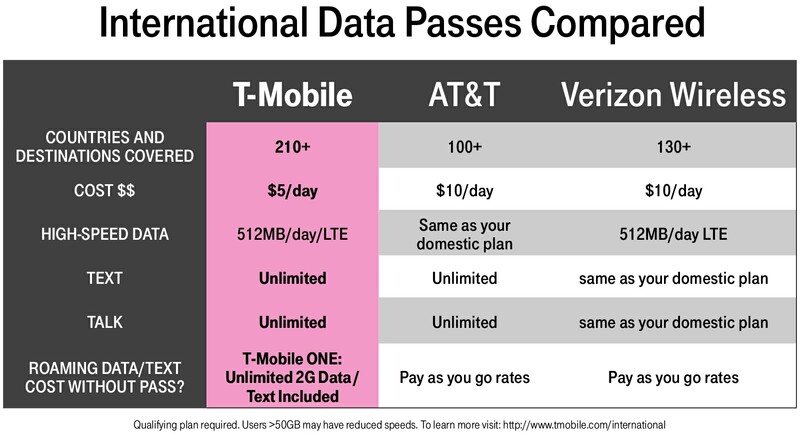 On top of that, without a special plan or pass, AT&T and Verizon will charge you almost $2/minute for international calls, but on T-Mobile ONE, you get unlimited data and texting in 210+ countries and destinations and just $.25/minute flat-rate calling! If you DO find yourself wanting high speed data and unlimited voice calls, the new $5 T-Mobile daily data pass gives you 512MB of up to 4G LTE speeds and all the unlimited calls you want to make for 24 hours in all Simple Global countries. To get your passes, simply log into the T-Mobile app or call Customer Care. Customers can also purchase data passes and get information on coverage in their destination by following a link included in the welcome message they receive when they arrive in a Simple Global country. Simple Global Comparison Chart. Download image. All of this T-Mobile travel goodness starts July 22, when the new countries are added to Simple Global. The new data passes will be available starting August 1. And it’s all available to all T-Mobile ONE customers and customers on legacy plans that include Simple Global. T-Mobile ONE includes tons of great benefits for travelers, including Netflix on family plans, free texting all flight long and a free hour of Wi-Fi on Gogo-equipped domestic flights. Not for extended international use; you must reside in the U.S. and primary usage must occur on our U.S. network. Device must register on our U.S. network before international use. Simple Global: Additional charges apply in excluded destinations; see www.t-mobile.com for included destinations (subject to change). Qualifying plan and capable device required. Voice and text features for direct communications between 2 people. Communications with premium-rate (e.g., 900, entertainment, high-rate helpline) numbers not included. Coverage not available in some areas; we are not responsible for our partners’ networks. Standard speeds approx. 128 Kbps. Int’l Data Pass: Service (including 512MB of data) available for 24 hours from pass activation. Usage rounded up to the nearest MB each session. Limit 2 passes per 24 hours.